Click on one of the addresses below for detailed info & photos! LOVELY, SPACIOUS 3-bedroom ranch home! Click here for more information & photos for this beautifully remodeled home. Located between Centennial Park and the Champaign Country Club, near shopping, schools, and easy walk to swimming pools and waterpark! Fabulous, spacious 3-bedroom ranch, with huge living room, dining room, family room/den w/ built-in bookcases and open floor plan, plenty of kitchen cabinets and much countertop workspace, dishwasher, central A/C. Approximately 1450 sq ft. Overlooks lovely landscaped private fenced backyard & large patio. One of the nicer homes you'll see at this price! Click here for more information & photos about this fabulous home in a great Champaign location! Spacious living room, elegant kitchen, open-layout, family room, dining room overlooking beautiful backyard and patio, nice laundry room, 2-car insulated garage, secret hidden wall-to-wall storage room behind built-in bookcases. 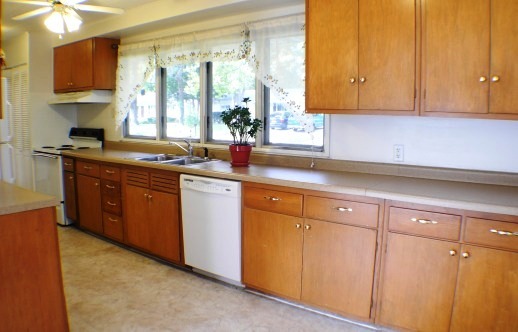 Beautifully remodeled kitchen with numerous rich wood cabinets, dishwasher, disposal. Well-insultated home, approximately 1400 sq ft, with central A/C, lovely large backyard for entertaining or for peaceful relaxation. Great location. Spectacular home! Our houses are NOT the usual poorly-maintained rental homes. These are beautifully-remodeled homes at a very competitive price... usually under the market value! You will be very comfortable, and proud to have a lovely home! We rarely get turn-over in tenants, as we try to keep them happy! Please email Info@AtHome-RealEstate.com, or call 217-344-9998 to schedule an appointment. Houses are agent-owned, and as a tenant you will receive outstanding service.